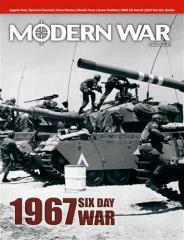 Six Day War: 1967, designed by Joseph Miranda, is a wargame of Arab-Israeli War of June 1967. There are two players in the game, each commanding a Front of the Israeli Army against various Arab opponents. One commands the Sinai Front; the second commands the Eastern Front. Each player also commands the Arab forces facing the other player (his opponent.) The game is designed in this manner owing to the massive qualitative superiority of Israeli forces in this war. The assumption of the game is that an Israeli victory was generally inevitable, so the intent is to place the players in a situation in which they have to compete with each other on both sides to win the greatest possible victory on their own Front. The map is divided into two sectors, one for each Front. Only units of that Front may operate in that sector. There are additional units, called Reserves, which can possibly be assigned to either Front. The objective of each player is to score the most Victory Points in terms of seizing objectives and destroying enemy units at the lowest possible cost. Meanwhile, the player will be using the Arab forces facing the other player to delay or even stop that Front. The game includes one map of Israel and the surrounding regions from the Golan Heights to the Suez canal (and all of the Sinai), and one counter-sheet (228 counters) representing all of the Israeli and Arab forces, color-coded to apportion them by their respect Front. The game includes one map (22x34”) and 228 counters. Terrorism in Mumbai: Terrorists strike in one of India's great cities. Operation Savannah: A South African mechanized forces sweeps across Angola at the start of its civil war. USN Littoral Warfare: The US Navy develops new tactics and warships for coastal operations. USMC EW Aircraft: The marines pioneered tactical electronic warfare aircraft. Corona Satellites: The CIA takes to outer space with a recon satellite program in an undeclared espionage war. Cold War Hunt for Uranium: In the 1950s, the US government started a craze for uranium prospecting which brought boom and bust to those caught up in it.